For the Magruder girls, it was a test against the best team in the state. It was a tough opponent to have for the opener, but they took it in stride and got a good feel for how they measure up. The developing sprint power came up well short of victory, but they know that it likely will not get any tougher than facing Northwest. After winning the 4x800 in 10:37, the Northwest girls won the 4x200 in 1:43 to Magruder's 1:46. There was hardly a mutter from the spectators. Perhaps no one had their stop watches running, but Northwest accomplished the 1:43 without two of their fastest runners, Britt Eckerstrom and India Knight. (In fact, Eckerstrom did not compete in this meet because she just recently returned from out of the country and needed some time to catch up on school work). Camry Torian did run on the 4x200 relay and it is apparent how much deeper she makes Northwest during outdoor track. Northwest did not field its strongest possible teams in the 4x100 or the 4x400. Magruder easily won the 4x100 in 55.0. 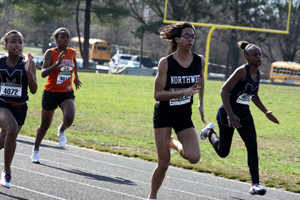 It looked like Magruder would win the 4x400 and split the relay wins with Northwest but Northwest freshman Tiara Wellman timed her anchor leg perfectly and kicked for an exciting finish in 4:11.8. Three Northwest girls won two events including Olivia Ekpone who won the 100m and 200m, India Knight who won the 400m and 800m, and Achankeng Acha-Morfaw who won the 100m Hurdles and 300m Hurdles. For Northwest, the meet was about increasing endurance and seeing how athletes responded when competing in events spaced closely together. Naomi Sheppard won the 1600 in 5:53.3 shortly after running on the 4x800 relay. Andrew Keyeremeh bypassed the 4x800 and ran a rare 1600 before competing in the open 800. Chris Miller had a tough workout with a 10:00 3200 sandwiched in between two 800's (following the 3200, he won the open 800 in 2:05). 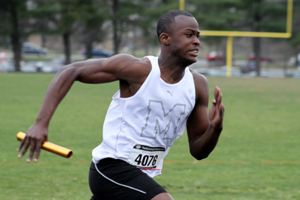 Miller and Northwest teammate Sheldon Trotman combined to win five events while Magruder won 11 others. I believe the 4x200 was won by Northwest only after Magruder was disqualified. Coach Timm explained that his boys team is one of the hardest working groups he has had and stressed how well they work with one another. Beating Northwest was a step in the direction to win the division title. Einstein, Damascus, and Paint Branch remain on the schedule. In the minutes leading up to the start of the meet, Coach Timm asked that all athletes gather near the long jump pits. The runways will soon be redone and benches will be erected in Darius Ray's memory, however Timm regretted that they were delays in the process. He said a word about Ray who was murdered in the winter of 2010. Darius Ray was not only an amazing athlete who competed in track to help turn his life around, but always spoke with everyone around him, opponents and teammates, in hope that he could help them improve as well. His positive attitude was infectious, and Timm asked that all athletes compete with that spirit today.